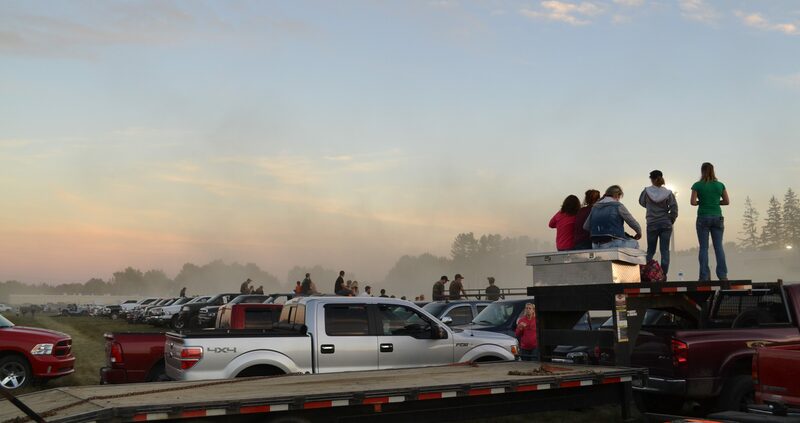 Spectators stand on their vehicle to watch the races at the race track during Farmington Fair week. 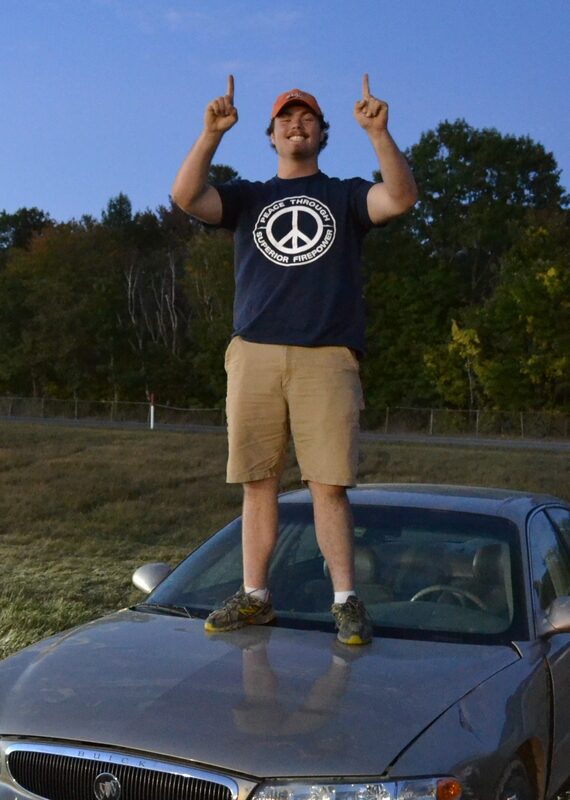 Caleb Walters stands on his winning Buick. FARMINGTON - The Drag Your Neighbor competition kicked up clouds of dust Wednesday night, despite a previous postponement due to a soggy track and a water truck running between races. 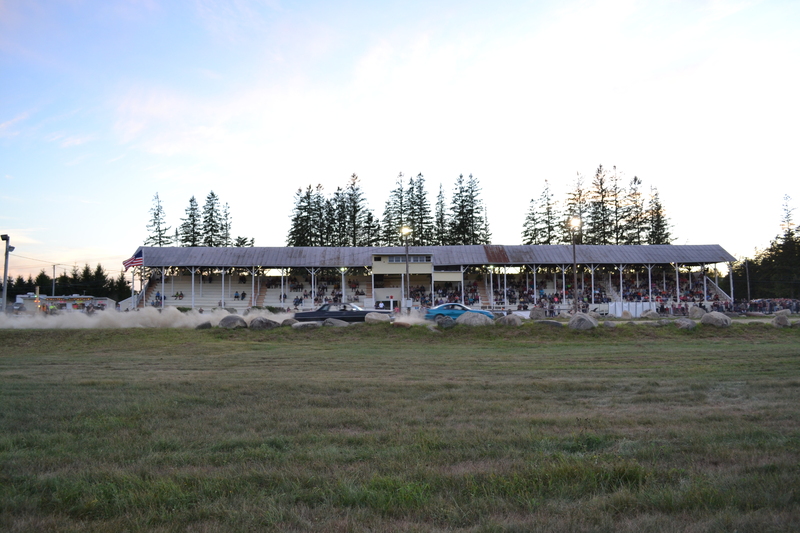 The third annual competition held during Farmington Fair week drew hundreds of spectators - both in the stadium seating as well as on the hoods and tailgates of vehicles. Although the announcer egged audience members on to cheer for one car or another, there was a common name humming through the crowd. Dustin Tyler, the standing champion of the event for the past two years, was expected to win again. “Everyone’s talking about your guy, Ariel," someone hollered across the packed tailgates. Ariel Hobert, Tyler’s girlfriend, sat on a truck with their two young children, ready to cheer. “My favorite part is beatin’ everybody,” Tyler said. A 25-year-old Mt. Blue High School graduate, Tyler works for Portland Glass company for a living, but loves the race more than any job. “The green light goes and you just put the pedal to the floor,” he explained. There’s nothing fancy about Tyler’s racing technique, or about his vehicle. A blue and black Subaru STI. “It’s all stock. No modifications at all,” he said. Unlike some of the other vehicles at the race, like "Home Grown" and "Dirty Addiction," two monster trucks with huge wheels and decked-out frames. Like Tyler, Caleb Walters chose the simple route as well: a wide, tan Buick. One that a grandparent might drive. 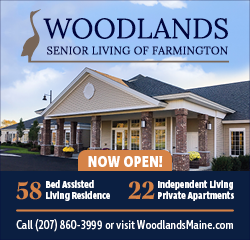 “She’s got some aerodynamic modifications,” Walters joked, referring to the dents on the front corner of the vehicle. Walters came in first for the two-wheel drive portion of the competition. A 17-year-old at Mt. Blue High School, Walters seems unsure about his parents approval of the race. “My dad told me to take it easy on the car. I think he’s hoping it will last me through college. But she’s a good vehicle. As long as I bring home a trophy, he won’t mind,” Walters said, jumping on the hood for a picture. After several hours of dust storms and revving engines, vehicles being eliminated after each race, the winner was finally determined. It was a solid first place win for the third year in a row by Dustin Tyler and his no-frills Subaru. Which just goes to show that you can’t judge a driver by his car. Two cars race in the Drag Your Neighbor racing event. 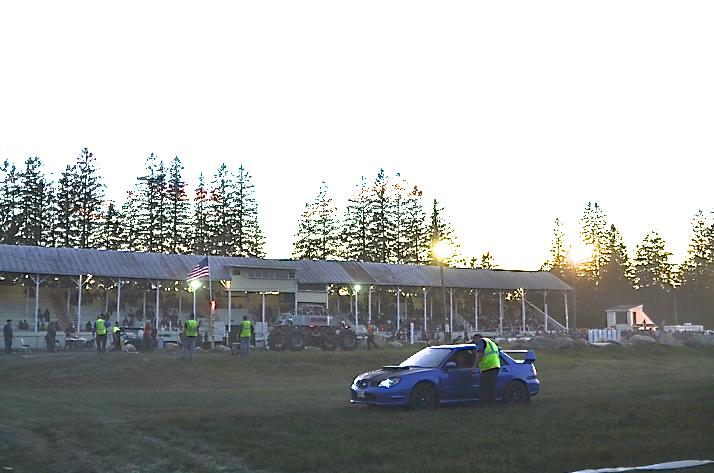 Dustin Tyler and his Subaru STI during the the Drag Your Neighbor races at the Farmington Fair. 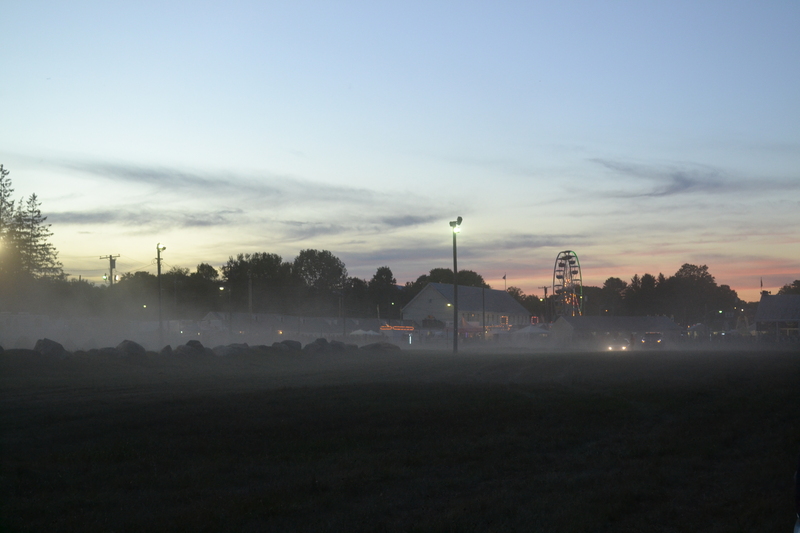 A dusty track marks the racing event during the 176th annual Farmington Fair. That Subbie made a lot of big jacked up trucks sad that night. What was the entry fee? And was there a prize?